Unlike other types of housework, I actually enjoy doing laundry … most of the time. Putting dirty clothes in the washing machine, pressing a button or two, and taking them out clean – what could be easier, right? Except when it’s not. 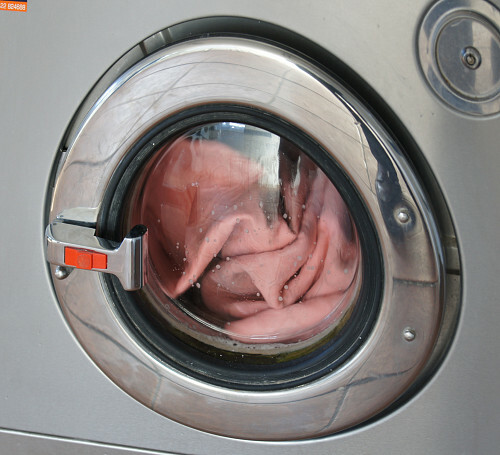 Have you ever reached into your washer and found a load of totally sopping wet clothing? If so, the mess is probably due to a washing machine that doesn’t spin. Find out why this happens and what to do to get your laundry day groove back. Problem: Not everyone loves laundry as much as I do. If you’re the type who puts it off needlessly, then tries to compensate by stuffing a ginormous amount into the washer at once, the likely result? A washing machine that doesn't spin. Fix: In this case, you may be punished for your procrastination by being forced to fish out a dripping wad of soggy excess fabric and put it in a laundry basket (you do have one, don’t you?) while the now normal-sized load does its thing. Then run the wet stuff you set aside through the washer. Problem: Your spin cycle won’t function as well – or at all – if the wash load is unbalanced. Generally, this happens when you’re trying to clean one or two heavy items, such as a comforter, bath sheet, or washable pet bed, and something clumps into a big, sullen lump. Interestingly, an unbalanced load can also cause the opposite problem, an ineffective spin cycle that won’t stop. Problem: It could be the positioning of the appliance itself that’s causing the spin cycle hiccup. Usually this issue is impossible to ignore, because your washing machine will make it loud and clear – with noise and vibrations aplenty. A front loader may even “walk” across your laundry room. Fix: Adjust the washer’s little legs so that the whole thing is absolutely level. Problem: This applies to top loading machines only. Top loaders have a device called a lid switch that signals to the washer when the lid is not properly closed. If your lid switch stops doing its job, your washing machine doesn’t spin, as a safety precaution. Fix: On the underside of the lid, you’ll find a small protrusion that activates the switch when you close the lid. If it’s bent out of shape so that it doesn’t make contact, try simply bending it back. If that doesn’t help, replace the lid switch (most models cost $50 or less). Problem: As a general rule, a washing machine doesn't spin normally unless the laundry load has been drained of water. Problems with draining usually stem from a drainage hose that’s become either kinked or clogged with small items like coins or buttons from your clothing. Problem: Even when your washing machine agitates just fine, trouble with the spin cycle might be caused by your drive motor. The motor’s spin mode can burn out even as the agitation function continues to work correctly. Fix: This last solution is not a DIY project unless you are very experienced and uber confident. The rest of us will need to hire a qualified professional to replace the motor.